If I am being 100% honest, then there were really only two things that really made me want to buy this palette. 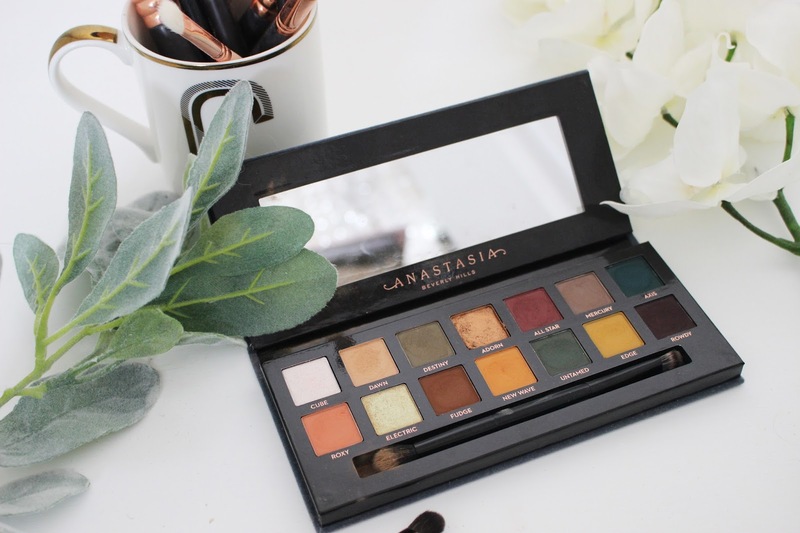 I first saw this palette, earlier on in the year, when leaked photos emerged on Instagram and the first thing I noticed was that it looked identical to my well-loved Modern Renaissance palette (except the packaging was a teal green rather than a blush pink). As it looked identical to the other palette, I assumed that the formulation of the shadows would also be the same; they would blend easily, be super pigmented and be long lasting when worn. 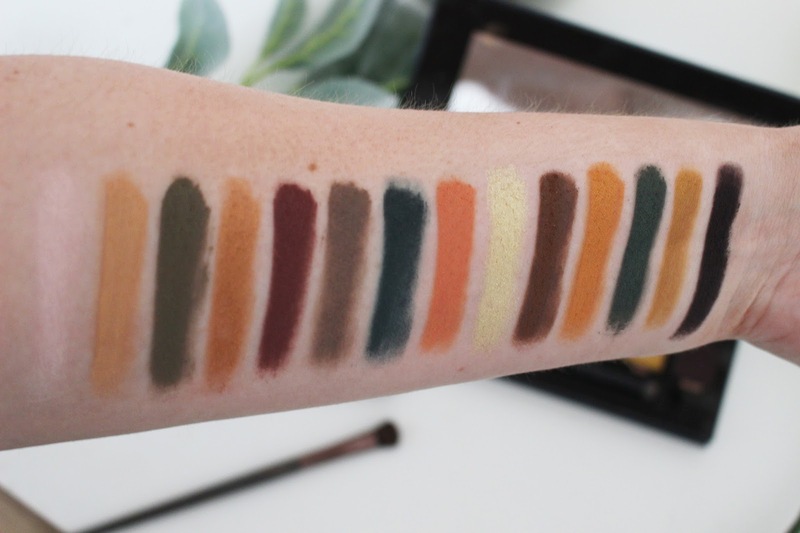 The other reason for me wanting this palette was the shades they had used - these are not colours I would usually gravitate towards, but the shades just really stood out to me and I thought that this palette would be perfect for Autumn, as well as getting me out of my comfort zone. The colours used gave me a real forest vibe and the yellow and greens reminded me of the 1970's. I don't own any other palette like this and I was just hoping that it would be as incredible as some of their other products. When this palette was first released, there was a huge amount of criticism for this palette (especially amongst YouTube's biggest beauty gurus). I first saw Alissa Ashley's video (linked here) and was so surprised to see her reaction to the palette. Her review was soon all over Twitter and social media, plus there was some feuding going on between Alissa and Anastasia's daughter on Twitter. Her main comments of the palette was that the shadows would not blend, there was a lot of fall out (which caused her to hit pan in one of the shadows) and she just could not make the palette work; even though she had attempted a look three times with three different primers. I watched a lot more videos and saw that they were commenting on similar things about this palette. My decision to buy this palette in the end, was when I saw that Kathleen Lights had done a first impressions video on the Subculture palette (linked here). Kathleen is someone that I have watched for years and I will always buy the makeup that she recommends and likes. 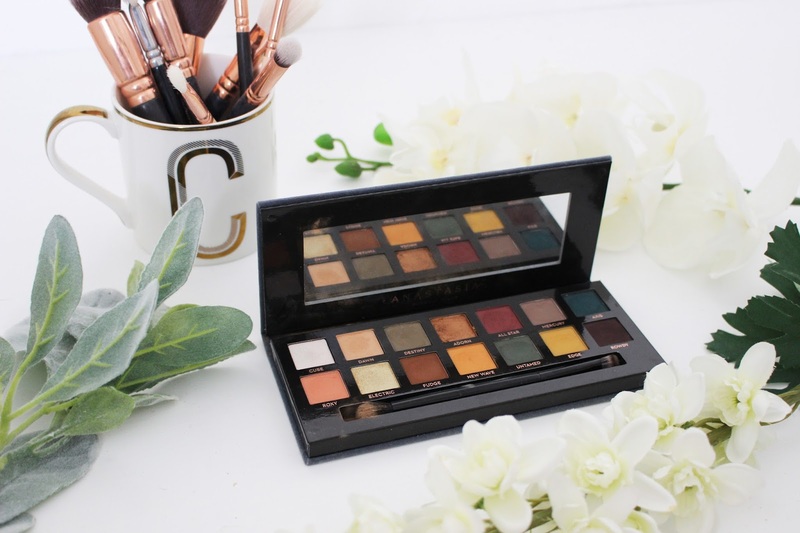 So when I saw here review of the Subculture palette was nothing like the others and she managed to achiever a beautiful eye look, I decided to grab the Subculture palette and see for myself whether it is worth buying or not. Before I give you my review of this palette, lets just quickly discuss the basic facts about this palette. This is a brand new palette from Anastasia Beverly Hills that has 14 shadows with three different finishes: ultra-matte, duo chrome and metallic. All of the shadows in this palette are brand new to the collection, except for the shade Fudge, which is a repeat shade (although I have heard from people who own the original Fudge, that this is not the same shade at all and is a lot more warm in tone). This has been described on the ABH website as being a super pigmented palette and a more grungy version of the Modern Renaissance palette. Each shadow has 0.02 oz of product, meaning there is 0.28 oz of product in the whole palette. A dual ended brush is also included in the palette. The palette retails in the UK for £41 from Beauty Bay and Cult Beauty, but on the ABH website it is being sold for £42. I do want to make a quick disclaimer before getting into the review. I have only tested this palette once so I can only give you my initial first impressions of the palette. I did manage to use quite a few shades from the palette when achieving my look, plus I did have to re-do my makeup as I was a bit heavy handed with the shadows at first. Therefore, I feel I can give you my honest thoughts of the palette. But please remember that I have not used every single shade, so some of the shadows that I did not use may perform differently, but I believe that they are similar to the majority of the shadows, in terms of formula. I firstly want to mention that I bought this palette a few weeks after it was initially released, meaning that by the time I had purchased this palette, Anastasia Beverly Hills had time to rectify a few of the issues (I am not sure if this was the case or not) but I believe that I was lucky and received a palette from a good batch as I did not experience half of the problems that other people had. Therefore, just keep that in mind when reading my review of the Subculture palette. Overall, I just love the whole concept of this palette; the shadows themselves are so beautiful and are not the colours that I am usually drawn to. The packaging is identical to that of the Modern Renaissance palette; with the same layout and felt packaging. I also love the fact that they went for a dark teal green shade for the felt, which I feel won't get as dirty as the blush pink felt of the Modern Renaissance palette. The whole concept of this palette was to create something more grungy and I love the use of greens and yellows in this palette. There is not one thing that I dislike about the way this palette looks. When I first saw this palette, I was undecided if it was really a palette that I would use; yes the shadows looked beautiful but they are completely out of my comfort zone. 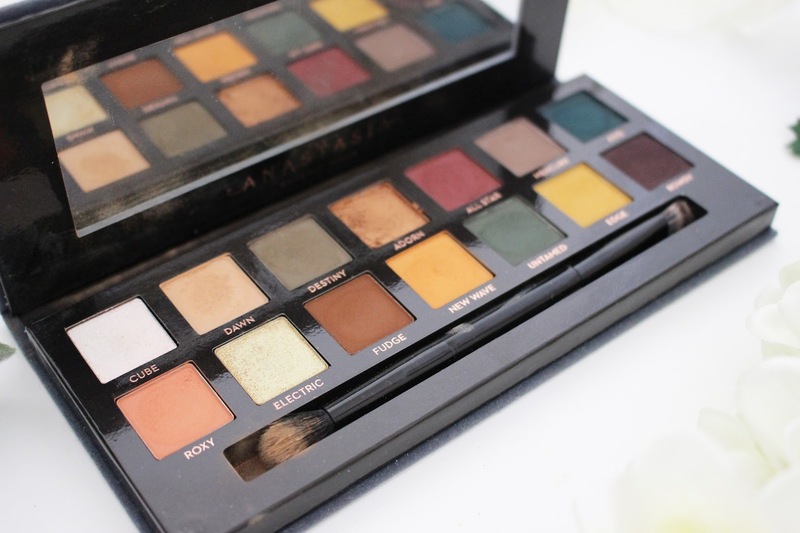 I would never even think about buying a mustard yellow or a teal green shade on its own, but ABH managed to lay out these colours in such a way that made this palette really appealing to me. 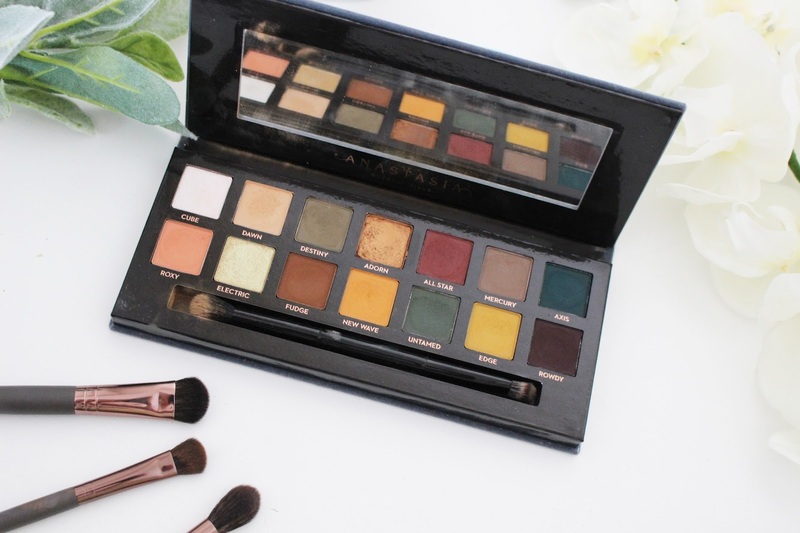 If you guys know me, you will be aware that I will usually go for a neutral or warm toned eyeshadow palette, so this grungy 70's inspired palette is completely different to anything I already own. However, now that I have this palette in my hands, I absolutely love the colours and think they are perfect for the upcoming Autumn and Winter months. I would say that this palette is more for me when I am feeling a bit more brave with my eye looks and want a bold eyeshadow look. This probably won't be a palette I reach for every single day, but I do love the look I achieved with this palette and will definitely be using it again. This is definitely not a palette for someone who only likes to wear a natural eye, as every look you create with this palette will be bold a more edgy. I was sceptical about how bright these shadows would be, but they are a lot more muted on the eye in comparison to when they are in the pan. When the shadows are blended out they are not as bright unless you really pack the shadow on. I absolutely love the colour selection and the look I managed to achieve was a edgy bronze look. I adore the shades New Dawn and New Wave as transition shades, whilst Adorn is a beautiful metallic shadow that almost has a foiled effect when paired with MAC Fix+ and then Rowdy is perfect in the outer V to give a smokey look to the eyes. The colours are just stunning and have really made me be a lot braver with colour choices. I know I am going to be buying some more palettes that have similar shades and might even go for even brighter palettes in the future. I was really hoping that the formula of these shadows would be identical to that of the Modern Renaissance palette and I will admit that they are not exactly the same, but in general the formula is still pretty good. When this was released, the blendability of the shadows was the main focus for criticism; with most people really struggling to blend out the shadows. With the Modern Renaissance palette, the shadows just blended effortlessly whereas with the Subculture palette it is slightly harder. I personally did not seem to struggle too much with blending these shadows out, although I did find some eyeshadows a lot easier to blend that others. New Wave and Roxy were so easy to blend out and just looked amazing in the crease as a transition shade. One of the main things I noticed was that the shadows are a lot softer than other shadows from ABH, so to help with blending you only need to dip your brush into the pan once. I found it much easier to blend out the shadows this way and you can then dip back into the pan to help intensify the look (although I doubt you will have to do this). If you dig your brush into the shadow, you will struggle to blend out these shadows, so just remember to use a light hand to achieve a beautiful blended look. I do think I received a good palette and maybe that is why I didn't struggle as much (especially as I have not been doing makeup as long as some of these beauty gurus on YouTube). I would say that I did spend a bit more time on my eye look than normal, but I usually spend more time on my eyes anyway and I think my whole makeup routine took me 20 minutes longer than usual, which isn't too bad. I loved the end result and I could not believe how many people commented on how pretty my eye makeup was - some even thought my makeup had been done by a professional makeup artist. Therefore, even though it did take me slightly longer to blend out my eyeshadows, I didn't struggle to blend the colours together and they did end up creating a really pretty eye look. The shadows in this palette are probably the most pigmented shadows I own (beating Modern Renaissance and Kat Von D's Shade and Light palette). A criticism of this was that there was a lot of fall out when people dipped their brushes into the pan. A statement was released on behalf of ABH stating that the shadows had been pressed a lot softer than their other shadows. Therefore, because they are so soft there will be a lot of fall out. I've seen videos of some people hitting pan in the shade Roxy, however I did not experience that and I did not seem to have as much fall out as others. In fact I had the same amount of fall out as what I get with the Modern Renaissance palette. Fall out is not something that I am worried about and most eyeshadow palettes that are really pigmented will have some sort of fall out, although I would not be happy if I hit pan after using a palette one time. However, because the shadows are so soft, they are super pigmented. One dip of the brush into the palette will give you a pigmented eye look. Therefore, you definitely need a light hand with this palette. I did have to re-do my eye makeup because I was too heavy handed and the look was way too dark. However, when I redid it and only dipped my brush in lightly and tapped off all the excess pigment off my brush I got a really pretty look that blended out really well. Plus these shadows will last me such a long time. Having a pigmented eyeshadow that blends well is great but another quality that I want from an eyeshadow palette is for the shadows to last a long time. I don't want to have to reapply my eyeshadow every couple of hours because the shadows have flaked off or have blended away into nothing. I did my eyes with this palette at around 11am and my eye makeup was still looking exactly the same at 9pm at night. The shadows has not disappeared and you could still see every single shade that I had used; usually when I am using another palette the shadows will blend into one colour, but not with the Subculture palette. I was so impressed with the longevity of these shadows, so this palette is perfect if you have somewhere to be and you need your makeup to last a long time, like a wedding or a graduation. I did use the Tarte Shape Tape Concealer underneath which helped with the longevity, but even so I was still impressed. I really do like this palette; the colours are beautiful and for me the formula of the shadows were really good. I did experience some difficulties with this palette, but they were nothing that I couldn't cope with and nothing like the trouble that other people had with this palette. The look that I managed to create was really pretty and is something that I am willing to spend an extra 20 minutes of my day to recreate. Now that I have talked about the things I love about this palette, I now have to talk about the difficulties I experienced with this palette. 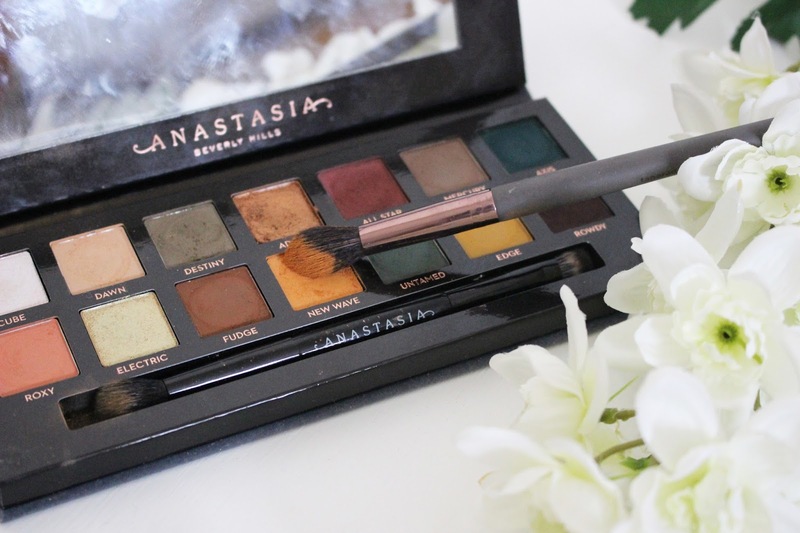 There are of course much bigger things to be worried about than whether an eyeshadow performs well, but as a blogger who focuses on beauty it is only right that I give you an honest review of this palette (especially as it is quite expensive). I know I have said this already, but I do think I received a good palette and maybe the batch I got my palette from had been rectified after the initial criticisms. But there are still some disappointing things that I need to tell you about this palette. Firstly, the main comment on this palette has been the amount of fall out that it produces. There are some people who have experienced so much fall out that they have hit pan immediately. A statement was released explaining that the way they had pressed the shadows was a lot different to previous shadows in the ABH collection. For me, the fall out was fine and I had a similar amount of fall out as what I had with the Modern Renaissance palette. Don't get me wrong there is still fall out with my palette, but I didn't seem to get much fall out under my eyes. All I really experienced was some fall out on the packaging and I had to tap my brush quite a bit to get rid of any excess pigment. But that is my one criticism of the palette is that I felt like I will be wasting product because I have to tap my brush repeatedly otherwise the shadow won't blend out properly and will look too harsh on my eyes. The other main criticism that I had heard about this palette is the fact that the shadows did not blend properly. I did manage to blend the shadows out and I was really impressed with the end result, but it did take me a lot longer to blend out the shadows. I think in total I spent another 20 minutes trying to blend out the shadows and trying to make the colours flow into each other more seamlessly. I did struggle to blend out colours when there was too much pigment on the brush and I did have to start my makeup over as I was too heavy handed with the palette and it just looked a mess. However, once I had learnt how light of a hand to use when blending these shadows out I didn't struggle too much. However, I don't want to have to spend another 20-30 minutes blending out my shadows. Therefore, this is really only a palette I will use when I have a lot of time to do my makeup and I just feel I won't reach for this palette as much as I would like because of that reason. Only buy this palette if you have a light hand when it comes to applying eyeshadow as you do not need to dig your brush into the palette to achieve a super pigmented look. Lastly, there is only one shadow that I do not like at all and if you have watched or read any reviews of this palette, then you will probably know which one I am going to say is not my favourite; introducing you all to ALL STAR. When swatched this shadows is a beautiful wine/maroon shade that I thought would look beautiful in the crease and in the outer V. However, I experienced the same issue as other people with this shade and that is this shade oxidises really badly when blended out. It turns from a beautiful maroon to a muddy dark brown. Also I found it would become a bit patchy when I blended it out and it did even remove some of the eyeshadow that was underneath it. I did make it work by blending New Wave over the top and really spent a long time trying to blend this one shade to make it look good. In the end my look did turn out really well but All Star will not be a shade that I will reach for that often. I have not used any of the duo chromes in the palette, but when I swatched them I noticed they seemed quite dry in comparison to the other shadows (which were really soft and buttery), however I think that using a setting spray will help sort out this eyeshadow. Another thing that I did not like was that there is not highlight shade. Cube in the pan looks like it would be a perfect brown bone and inner corner highlight as it looks white but it is instead a duo chrome shadow and turns out to be a pink shade that I cannot wear as a highlight. In this palette there are 14 shades that just remind me of the 1970's (with the green and yellow pops of colour). Anastasia Beverly Hills states that this palette is full of shades that range from grungy mattes to bold metallics with an underground edge. There are three finishes to these shadows; ultra-matte, metallic and duo chrome. I have only tested nine of the fourteen shades (Dawn, Adorn, All Star, Roxy, Fudge, New Wave, Edge and Rowdy) so I can only give my opinion on these shadows. When I bought this palette I was surprised to see that there was only one metallic shade in the whole palette and then there are two duo chrome shades. I don't use duo chrome shades that often so I would have preferred for there to have been a couple more metallic shades in the palette. Therefore, I do feel like I will sometimes have to use a metallic shadow from another palette for some looks, although Adorn is a beautiful shade and will work with so many different looks. It does say on the ABH website that there are certain ways to use this palette, to make the most of the shadows in the palette. Firstly, when it comes to the one metallic shade you should pair it with a setting spray and apply the shadow with a flat brush to get a high-impact metallic finish. The same tip is given when using the duo chromes but instead you should use a small synthetic brush when applying the shadow. I did use MAC Fix+ with Adorn, and I applied it all over the lid, which have a beautiful foiled effect to my makeup look. The shades are unlike any other shades that I currently own in my makeup collection. I would never think to buy a mustard yellow eyeshadow on its own, but it just seems to work with the other shadows in this palette. I think you can create so many different looks with this one palette and even though the look I created was a bit more of a smokey bronze look, I still managed to wear it during the day and it still looked amazing. I love the shades New Wave, Roxy, Axis and Rowdy - and they are probably the shadows that I will use time and time again when I do reach for this palette. Like I have already said I did struggle with only one shade, which was All Star. This shade was the only shadow to oxidise and become a bit patchy in certain areas. I thought it might have been a reaction to the shadows underneath, but even when I blended the shadow onto bare skin, it still oxidised, so this will be a shade that I will not use that often. Apart from that one shade, I really like the other shadows and they seem to blend pretty easily for me and they are very pigmented. I have swatched the other five shadows and think they look absolutely stunning and I am definitely going to use them in the future to create another look. I love the fact that there are 13 brand new shades in this palette - the only repeat shade is Fudge. However, I have heard that this is not the same shade as the pre-existing Fudge. Instead this shade is a lot more warm toned in colour and is nothing like the other shade. I did think it was a bit strange to call this shade Fudge if it is not the same shade as the original shadow. 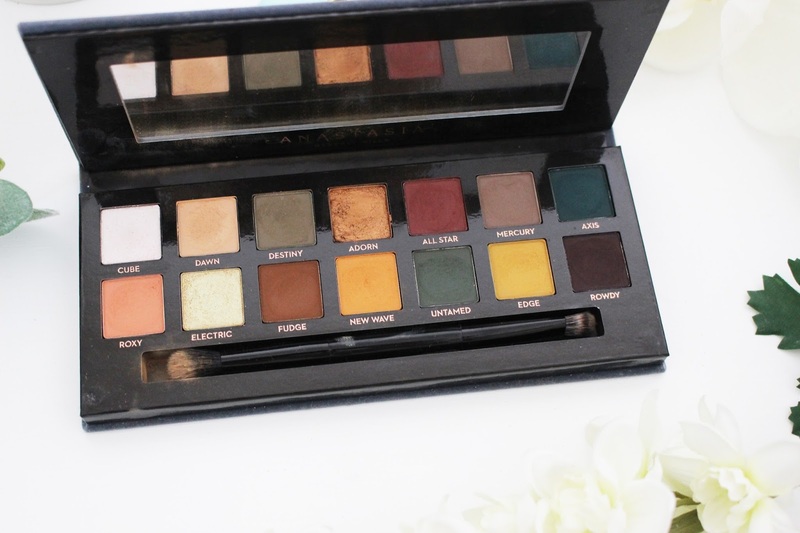 Overall, I think the colours used in this palette are so innovative and I don't currently own any other palette like this one (although there is a Marc Jacobs palette that has some green shadows in which I am considering buying). I would not usually be bold enough to wear a green or yellow shadow on my eyes but this palette has really bought me out of my comfort zone when it comes to makeup. As a main step in my makeup routine, I will always apply either an eyeshadow primer or concealer prior to any eyeshadow application. Sometimes though eyeshadow primer can seem like an unnecessary step in people's makeup routine, so I did decide to test this palette without eyeshadow primer and the shadows were still super pigmented but I did struggle to blend without using a primer first. I feel like the shadows blended out to create a softer look when I used the Tarte Shape Tape Concealer first, whereas without primer the shadows just looked a bit more harsh. This really is a palette where you need either a concealer or primer underneath just to help make the blending process slightly easier. I did also find that without a primer, my eyeshadow didn't last as long. Whereas, with a primer, my makeup still looked flawless when I was about to take off my makeup for bed (which meant it has lasted around nine hours without the shadow disappearing or blending into one shade). I would definitely recommend using a primer or concealer with the Subculture palette. When I want a metallic or shimmer shadow to really stand out, I will always use MAC Fix+ or some other setting spray, just so I can get a high impact metallic finish that really pops on my eyes. Sometimes, I will also apply my transition and crease shade and then use a cream shadow where I am going to apply my metallic or shimmer shadow. I must admit the first time I did my makeup this way, I thought I had ruined my eye makeup and would have to start again, but this technique really does work. Then with a flat shadow brush I will apply the shadow directly to the part where the cream shadow is and blend it into my outer corner shade. This is just a quick step that will help the metallic shadow stick to the lid and will make it appear more vibrant and helps to make your shimmer shadows last a lot longer. This will also help to give it a foiled effect as well. I must admit this is the first time I am conflicted over whether to say Subculture is worth buying. I do believe I got a palette from a different batch that was maybe fixed after the initial criticism from Alissa Ashley's video, because I did not have the same issues that she had with the palette. I did manage to blend the shadows out and create a really beautiful look with this palette, plus I did not seem to have as much fall out as some other people did. I had pretty much the same amount of fall out that I get with any high pigmented shadows. I absolutely love the colour selection and I have never had so many people compliment me on my eye makeup than when I wore the shadows from the Subculture palette. I would agree that All Star is a shade that I will probably not use again; it is the only shade that oxidised and blended into a muddy chocolate brown. When I first tried this palette, I had to start again because I was just picking up too much pigment and the eye look was just too dark and harsh. However, when I did my makeup for the second time, I used less product and made sure to tap off any excess pigment off the brush and I did end up with a pretty eye makeup look. It did take me a bit longer to do my eye makeup (I spent around an extra 20 minutes blending out the shadows) so if you are someone who doesn't like to spend a long time blending then this palette will not be the one for you. I would also say that this is not a palette for someone who is new to makeup as it is going to be harder to blend the shadows out and there are plenty of other eyeshadow palettes that are perfect for beginners (even the Modern Renaissance palette is good because it is so easy to blend the shadows). Overall, I do like this palette and I think the look I ended up with was really beautiful. However, will I reach for this palette as much as my Modern Renaissance palette, I don't know! I think if I have the time to sit down and spend an extra 20 minutes blending then I will, but I can't see myself reaching for this palette every single day. The fall out does not bother me at all and I will use this palette again. I love the shades and the formula is pretty good, so for me this was worth buying. I just think if you do buy this, then it is almost like a lucky dip, you may end up with a palette that is beautiful and works well, like mine, or you could end up with a palette that will hit pan after the first use and won't blend. I do think this palette is unlike any other palette I will ever own and this was one of the main reasons for me buying it. I am not unhappy with this palette and I am glad I have it in my collection, but I just hope if ABH create another palette then every palette is great and not just some. So in my final conclusion, I do not know whether it is worth you buying this palette, I really think you have to consider the fact that my palette worked for me but also remember that there are some people who cannot make this palette work for them. Really this is your decision, but if you are a beginner in makeup then I don't think this is the palette for you. 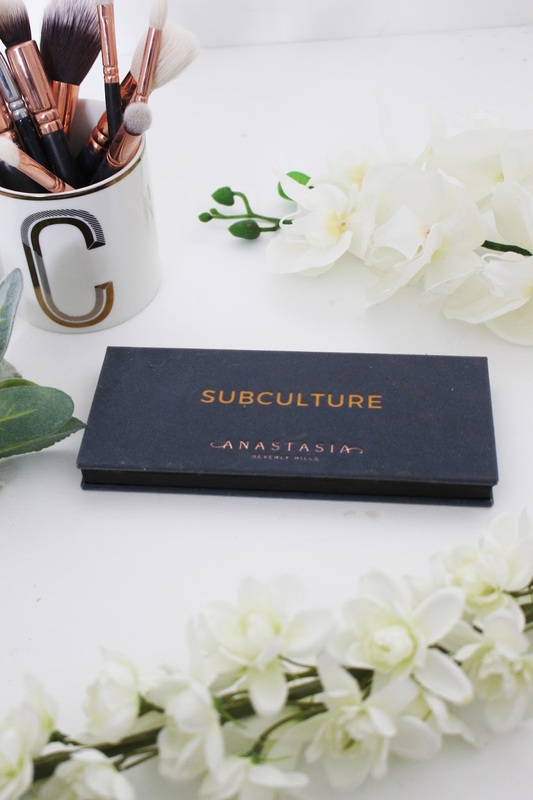 The Anastasia Beverly Hills Subculture Palette is £41 and can be purchased from Beauty Bay and Cult Beauty. It is $42 from Sephora and £42 from Anastasia Beverly Hills. I would love to know what you think of the Subculture palette and whether you love it or regret buying it. Also let me know in the comments what your favourite products and least favourite products are from Anastasia Beverly Hills.